We are all time poor. We enough on our plates to worry about commenting on other blogs. However, this could be a bad decision. You could be missing out on loads by neglecting this. And if you think comment writing is time consuming, it isn't once you know how. Just like with all tasks, practice makes perfect and it gets quicker the more you do it. "10 steps!" I hear your brains cry out. It may seem like a lot, but actually most of these actions will happen really quickly once you become a slick at comment writing. It's just a method of ticking these off one by one until they become part of your subconscious. You will find yourself doing many of these without even thinking about it. If you make an effort at the beginning of your commenting career to note down the best blogs to comment on, you will save yourself heaps of time later on. Get at least five excellent examples under your belt at first. Once you become better at this, find the next five. See which other bloggers are commenting, and follow them to find more. Ask your friends for recommendations. This is all part of developing a consistent process. However, variance is a good thing too, hence the suggestion to find new blogs on a regular basis. Readers that obviously haven't bothered to read the post carefully before they comment stick out like sore thumb. They either miss the point or mention the wrong thing, and look a complete fool for doing so. If you haven't much time, the urge to skim may be overwhelming. We are all guilty of this. But it will help you immensely with the next tasks if you read the post properly. Of course the post would be much easier to 'glean' if it contained multiple subheadings like this one does. One of the functions of breaking up the text is to aid quick readers. It also shows the blogger wants to make life easier for comment writing. Rather than just launching in (similar to jumping in at the deep end), spend a few seconds thinking about the main meat and two veg of your comment. There are many commenters who don't do this, and as a result produce useless and unhelpful responses. Dredge through your experience for practical tricks and tips, or your experiences for a story or anecdote that is relevant to the subject. Write comments that provide a constructive benefit for both the blogger and other readers, or retell a memory people can relate to in order to understand your point of view better. Ideally there are two names that should be involved in a comment. The blogger's name which you refer to at the beginning of your comment, and your name which you add into the submit details. Names (identities) are important. They aid recognition, show you're human and help towards forming a mutual friendship or relationship. Anonymous comments lack credibility, and no salutation at the beginning of the comment will not warm the blogger to what you have written. You will want them on your side if you want your comment to get published. The first sentence should at least show you've read the original post properly. This is when you write a brief and concise sentence revealing the main point of the subject and whether you approve or disagree. This isn't as easy as it sounds, hence why many commenters fail to do this. However, it is something that will improve with practice, so it's worth taking time at the beginning to make an effort. This tactic of comment writing will increase the chances of getting your comment accepted. However, beware of repeating verbatim or stating the obvious while doing this, or the effect will be lost. Comment writing increases in success the more you say in your response. The one-word or one-sentence comment has no traction, as it does little to contribute towards the post it is attributed to. Focusing on a minimum of three sentences will lessen the task as a chore. However, as you get better at comment writing, you may find yourself writing a lot more. 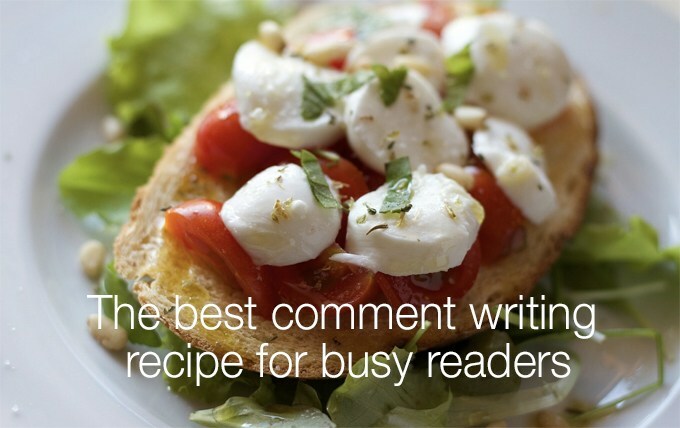 A comment with more content is more agreeable for all those who are associated with the blog. Once you get into the habit of commenting regularly, you'll soon find yourself writing more than the three sentence restriction. But beware of writing too much, as an over-long post may undermine the blogger or run the risk of being seen as boring. Finally, if you haven't already done this in the first sentence, you could thank the blogger for their post. Especially if you have learned something new or you have been suitably entertained. Avoid over-thanking though. Commenters who are overwhelmingly gracious or overbearingly smarmy run the risk of being seen as spammers. This is a tactic most spammers do to hopefully get their comments published. If you have already expressed your thanks, try writing a brief summary of the comment instead. Close the state of play by drawing attention back to the bigger picture presented by the post's subject. Hey, what about the remaining 3 steps? I'm going to be cruel and refrain from allowing you access the other steps in this post. If you want to know what the remaining three steps are to the 10 steps for essential comment writing, you will have to join The Commenting Club to find out (look for April 2018's page). Not only will you have your curiosity satiated, it will be heightened even more with the extra information you will learn as a member. All you have to do is to click on the button below, sign up and everything will be revealed! Click here to access the 3 remaining steps! Would a Featured Comments plugin be useful to you? You’re a tease Alice, but I can highly recommend being part of the Commenting Club. I’m learning so many tips to make commenting part of my weekly schedule. I like your 7 tips, especially the first one having regular blogs to read. That’s something I’m working on. What do you recommend for saving these blogs to read more easily Alice? Thanks. Hi Tracey-Jane, thanks for commenting. If course you’ll get to see the other 3 tips as you’re already a member of The Commenting Club. I use the application Pocket to store any posts that attract my attention so I can read and comment on them later. (See this post https://fairyblogmother.co.uk/review-pocket-beginner-bloggers/.) It has the added benefit of storing them for reference purposes later. Once you know the blog will continue to provide posts that are worth commenting on, subscribe to their RSS feed (if they have one) or subscribe to their newsletter to be aware of them whenever anything new is posted. Alternatively keep a list of good blogs and make a regular entry in your schedule diary to check them for new posts to comment on.